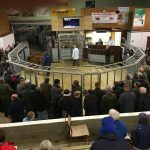 Stirling – Caledonian Marts on Thursday February 22 sold 211 cattle, comprising 126 prime bullocks, heifers and young bulls, and 85 cast cows and bulls. All classes of cattle upheld recent weeks prices and once again, more could have been sold to our large ringside of buyers. Bullocks sold to 248p (twice) for Limousins from Learielaw, Broxburn and Brockwoodlees, Canonbie, purchased by T Johnston, Butcher Falkirk, and to an amazing £1696 from South Flanders, Kippen. Heifers sold to 250p for a Limousin from Brockwoodlees selling to G Kirk and Son, Butcher, Denny and to a whopping £1670 for a Limousin from Dalchirla Farms, Muthill. Bulls sold to 228p for a Limousin from Mains of Throsk, Stirling to Charles Kirkpatrick and to £1572 for a Limousin from Craighead, Torrance. Also forward were 85 OTMs, cast cows and bulls. Cows would be dearer on the week again therefore many more could have been sold to sellers advantage. All classes of Cows and Bulls needed on a weekly basis. Please contact Oliver Shearman on 07730 046252 for more information. Beef cows averaged 138p selling to 202p for a Charolais X from A Purdon, Easterton and to £1540 for a Charolais from JM More, Beild. Dairy cows averaged 124p selling to 151p from M/s Patterson and Sons, Stenhouse and to £1200 from WA Hume and Co, Easter Clune. Cast males and bulls averaged 142p selling to 178p for a Limousin from D Piper, Millearne and to £1739.50 for a Limousin from Dalchirla Farms, Muthill. £1550 Shutterflat £1324 and £1228 Millearne. Stirling – United Auctions on Thursday February 22 sold 5,069 prime sheep comprising 3,307 old season lambs selling to an average of 210.23 ppkg and 1762 ewes and rams. Old season lambs (3,307): Harviesmailing (Btex) £124; Balleny (Tex) £117.00, Drumdowie (Suff) £113.00; Wester Thomaston (Chev) £112; Penston (Char) £109.00; Burnhead (BF) £105; Kerry Cottage (Mule) £104.00; Philiphaugh (Chev/Mule) £104. Old season lambs (3,307): Harviesmailing (Btex) 286p; Stanley (Tex) 249p; Woodhead of Aberdalgie (Chev) 247p; Woodhead of Aberdalgie (TexX) 245p; Ardtornish (Suff) 229p; Gilston (Chev/Mule) 221p; Redheugh (Char) 216p; West Lethans (BF) 214p; Kerry Cottage (Mule) 212p. Ewes (1762): Cherryfield (Tex) £144.00; Southfield (Suf) £118.00; Kinaldy (Chev) £100.00; Ardtornish (Mule ) £95.00; Cherryfield (BFL) £91.00; Philiphaugh (Chev/Mule) £88.00; Fullfordlees (BF) £75.00. DINGWALL – Dingwall and Highland Marts on Thursday February 22 sold 2,189 sheep of all classes. Ewes (338) averaged £47.70 and sold to £86 gross (twice) for a Suffolk from 8 Coll, Isle of Lewis and a pair of Cross’s from Teanluick Croft, Muir of Ord. Cheviots gimmers from the dispersal from Upper Milton, Lairg. Rams and feeding sheep (74) sold to £136 gross for a Texel ram from Dell Farm, Whitebridge. Lambs: Chev – Upper Milton, £100; SuffX – 2 Corbett Terrace, Uig, £90.50; TexX – Easter Strath of Auchterflow, Killen, £90; BeltX – Lochdhu, Nairn, £87; Cross – Knockglass Farm, Dunbeath, £86; CharX – Culligran, Cupar, £82. Ewes: TexX – Dell Farm, £85; Chev – 27 Melbost, Stornoway, £84; SuffX – Balvaird Farm, Muir of Ord, £76; Mule – Rhevackin Farm, Kiltarlity, £73; CHM – Auchmore Farm, Muir of Ord, £73. In-lamb gimmers: Chev – Upper Milton, £130, £100. In-lamb ewes: CHM – Woodlands, Dingwall, £108, £98; Chev – Knockglass Farm, £90; Mule – Woodlands Farm, £90; TexX – 2 Marrishadder, Staffin, £90. Dingwall and Highland Marts on Friday February 23 sold 13 Blackface females at its show and sale. Mr A. Williamson, Eallagro, Isle of Lewis, judged the Blackface section and awarded his champion to the first prize in lamb gimmer from Midlock Farm, Crawford, a daughter off a 12K Aitkenhead carrying twins sired by 90K Darchirla, realising £600 to Mr J. D. Davidson, Waterside Farm, Bridge of Alford. daughter off 50K Dalwyne carrying twins sired by 6K Auldhouseburn, realising £400 to Mr J. MacMillan, East Durran, Castletown. In the Blue-faced Leicester section the top price was awarded to Midlock Farm for a ewe lamb sired by 1538/J21 Midlock Bronco out of a 980/C2 Hewgill dam realising £500. Blackface – nine gimmers, £354.44. BFL – four lambs, £410. Blackface – In lamb gimmers – Crackaig, £560, Midlock Farm, £520. BFL ewe lambs – Midlock Farm, £480. Stirling – United Auctions on Wednesday February 21 sold 1050 store cattle and young bulls, 126 cast cows and forward cattle and 1882 store and breeding sheep. Bullocks (561) -averaged 230.97p to 294.7ppk for a 308kg CHX from Ashmark, and to £1400 for a 718kg LimX from Balcaskie. B&W bullocks (50) – averaged 157.7p to 190.2ppk for a 418kg HOX from Meikle Camoquhill, and to £850 for a 574kg HFX from Easter Frew. Heifers (387) – averaged 225.85p to 266.4ppk for a 289kg CHX from Ashmark, and to £1340 for a 666kg CHX from Newmill of Castleton. 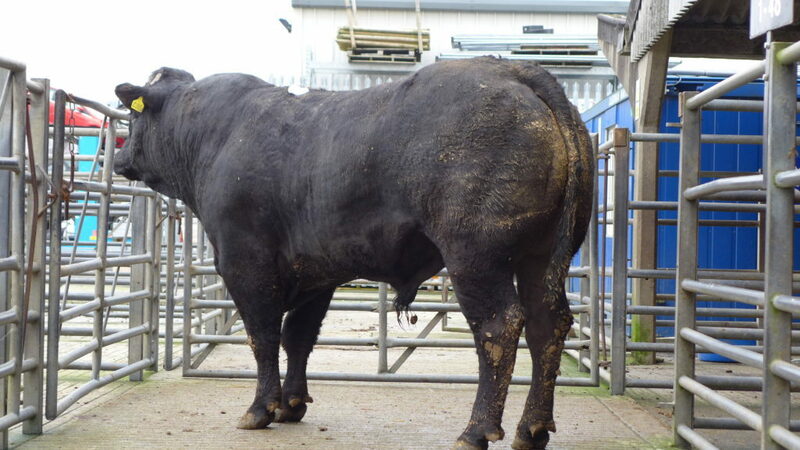 Young bulls (52) – averaged 203.4p to 253.5ppk for a SimX from Gateside, and to £1280 for a LimX from Drumtorber. Beef cows (91) – averaged 150.8p to 211.9ppk for a AAX from Burnside of Balhaldie and £1730 for a BRBX from Netherton. Dairy cows (20) – averaged 114.52p to 140.4ppk for a HOX from Claylands and to £895 for a HFX from High Branchal. Forward cattle (15) – averaged 177.32p to 200.9ppk for a LimX from Hatton of Cargill and to £1370 for a LimX from Hatton of Cargill. Heifers: Up to 250kgs- Gateside £575; Barney Mains 243.2p; 251-300kg – Crailloch £780; Ashmark 266.4p.